Faye Fulghum remembers V-E day well. The entire town showed up at Garden & Palafox to celebrate with hugs and kisses. 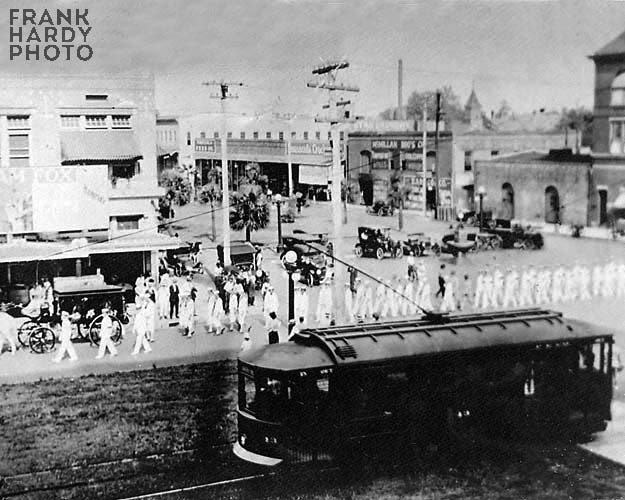 This is a 1916 military funeral – note the horse drawn caisson in front of the Isis Theater. Showing that day was Sins of Men starring Stewart Homes and Dorothy Bernard. My father, who was born at the old Sacred Heart Hospital in Pensacola in 1927, told me that at one time there was a tiny creek/stream in the median of Palafox that had been filled in. That may have been a water source for the fountain. There was a “fountain” in the intersection of Palafox and Garden that was for watering horses. It is now in front of the post office at 101 South Palafox. There were two creeks that ran on the east and west side of downtown Pensacola. Washerwoman Creek was about where Spring Street is and Cadet Creek just east of Alcaniz. The British built a “ditch” or canal between the two streams that ran east and west along Garden street. The area north of Garden was very swampy. When development moved north of Garden, around the turn of the century, there was a ditch along Palafox to drain the swamp land. This is probably the creek you father was talking about.